Hanakimi is famous for flower girls' dresses,each dress is individually tailored by our skilled artisan,and handmade with the use of light machinery that is not automated.Each layer of the skirt is 360°cutting,showing a natural stereo without bustle can be,your little princess will be like a butterfly dancing in our dresses.Cotton,gauze and satin make up this dress,cotton lining is soft and comfortable,like a second layer of baby's skin;the gauze we used felt exquisite and soft,not easy to deformation;we select high-quality satin,higher prices,smooth and rich luster.We also choose YKK zipper,safe and durable,the price is 10 times of the ordinary zipper,zipper head had be done anti meat pinched processing.Everyone of our accessories are handmade,with a safety pin.The brand of yarn we choose is famous in the world,uniform,shiny,and not easy off-line.All of our materials are in line with the relevant safety standards,each piece from Hanakimi and our family of brands is handmade and treated for highly quality, comfort and easy care.It's our pleasure to make a unique dress for your little princess if you want to custom a size. 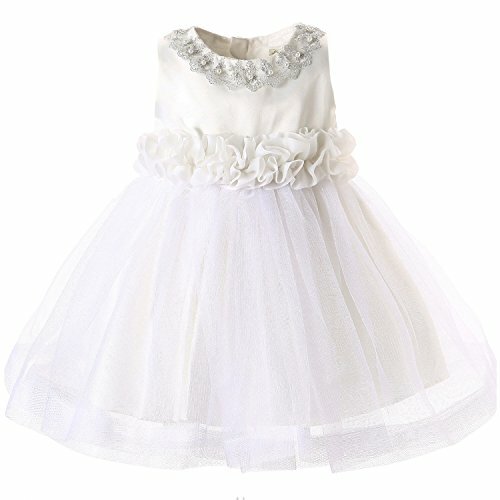 Great for communion,prom,flower girl, birthday,wedding,party,ceremony and other special occasion. If you have any questions about this product by Hanakimi, contact us by completing and submitting the form below. If you are looking for a specif part number, please include it with your message.